Like Rachmaninov, Scriabin and Prokofiev, Nikolai Medtner (1880-1951) fulfilled the dual role of composer and pianist, making his mark on the history of Russian music in the first half of the twentieth century. He could be proud of his pianistic credentials, tracing his lineage back to Franz Liszt via his teacher Pavel Pabst at the Moscow Conservatory. In his early years he performed a great deal, with the music of Beethoven becoming something of a speciality. Later his concerts became concentrated on the performance and promotion of his own music. As a composer, all his works featured the piano - solo sonatas and smaller pieces, concertos and chamber music. In 1936 he settled for the remainder of his life in London, where he taught, gave concerts and composed, apparently to a strictly ordered regime. Melodiya give no details of the recordings except to say that they were made between 1930 and 1947. Most of these have previously been issued on Vol.1 of APR’s Medtner Solo Piano Edition entitled ‘The Unpublished Columbia Recordings’. The composer/pianist had made some test pressings for Columbia in 1930/31, which remained unissued. Later, when Columbia and HMV merged to form EMI, he re-recorded some. In 1947, under the sponsorship of the Maharajah of Mysore, he further set to work to record more piano pieces, concertos, chamber works and some vocal items with Elisabeth Schwarzkopf, Oda Slobodskaya and Tatiana Makushina (review ~~ review). This CD has been a marvellous discovery, as much of Medtner’s oeuvre is unknown to me. Listening to this piano music, I find it difficult to understand why his music is neglected; it is quite unjust. There is a wealth of invention and imagination in these miniatures. They run the gamut of emotion from passion and drama, to ardent song and introspection. Many require a formidable technique from the player. Some show advanced harmonic progressions. Op. 17 no. 2, Op. 20 no. 2 and Op. 31 no. 1 are tinged with a Russian flavour, while op. 17 no. 2 (Daphnis and Chloe) is imbued with passionate lyricism. In Op. 51 no. 1 and Op. 38 no. 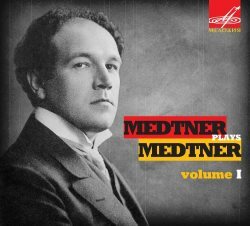 3, Medtner explores dance rhythms. He realizes his vision of these compositions with virtuosity and sensitivity. He would have been in his fifties when these recordings were made, and there is no doubt that his technique was still in good shape. The items here have been lovingly restored by N. Radugina and sound more than acceptable for their age. I’ve never heard the APR transfers to compare (see reviews of Vol. 2 and Vol. 3). Notes in Russian, English and French are adequate, though the English translation is a bit rough-edged. My experience with this disc and my unfamiliarity with Medtner’s compositions urges me to look forward to Vol. 2.